If you’ve watched Chloé Aurard take a shift, you’ve already seen that she knows her way around a hockey rink. She is always hunting down the puck, always looking to dish a pass through a seam, always thinking of what the next play should be. She’s got a great feel for the game. So it might surprise you to know that the first time she can remember stepping out on the ice, she was a little confused. “I started by skating with figure skating skates, and I was always wondering where my hockey stick was,” Aurard said. It didn’t take long for her to just grab a stick and start playing, or for those around her to realize how good she could be with one in her hands. Over the last couple of years, Aurard has starred at the IIHF Under-18 World Championship, led her Vermont Academy team to the NEPSAC Division II title, and burst onto the college scene at Northeastern as a rookie, playing immediately on the Huskies’ top line. She’ll be a player to watch for Team France as they make their very first appearance at the top level of the IIHF Women’s World Championship this week. While most people may not think of France as a huge hockey country, Aurard hails from Villard-de-Lans, a small town that loves winter sports, especially hockey. Both her parents, her older brother, and her twin sister all played hockey when she was growing up. That fostered a lifelong love of the game for Aurard. She actually used to want to be a goalie when she was younger, but says her first coach noticed right away that she seemed to have a nose for the puck, and put her up front. As she started to climb the hockey ranks in France, programs in North America started to take note of her as well, and she was offered the opportunity to head to Vermont Academy in Saxtons River, Vt. for high school. Her and her twin sister, Anaïs, went together, which helped a lot with learning English and getting used to some of the culture changes. It was also the first time Aurard had played on an all-girls team; she typically played with the boys in France, so she had to adjust to a game with no open checking. By the time she was a senior at Vermont Academy, in 2017-18, she was growing into a bigger role with the team and leading them through the playoffs. Marshall didn’t take up the head coaching job at Vermont Academy until Aurard’s final season, but she got to know quite a bit about her during that time anyway. She realized almost immediately how much Aurard loves hockey; Marshall says she was at the rink all the time, and she was the kind of kid who’d be shooting pucks in basements, or walking around campus with her hockey stick. That directly translates to her strengths on the ice. Marshall was doubly impressed with Aurard’s character off the ice, too. Aurard said it was Marshall who instilled some of that love for the game in her—or at least brought it out more fully. Juggling training with school full-time can be draining for any player, and Aurard says there were times when she grew a little tired of the routine. “[Marshall] made me realize that hockey is just something we love, and that sometimes it’s not the fact that you win or lose a game, it’s the fact [that you] play with people that you won’t play with ever again, or meeting different people, and just being happy at the rink,” Aurard said. Aurard led Vermont Academy to the NEPSAC Division II championship and the Lakes Region championship in 2017-18, and was named league MVP. Still, she didn’t come into college as one of the most highly-touted rookies, despite her success in prep school and some good performances already with Team France. 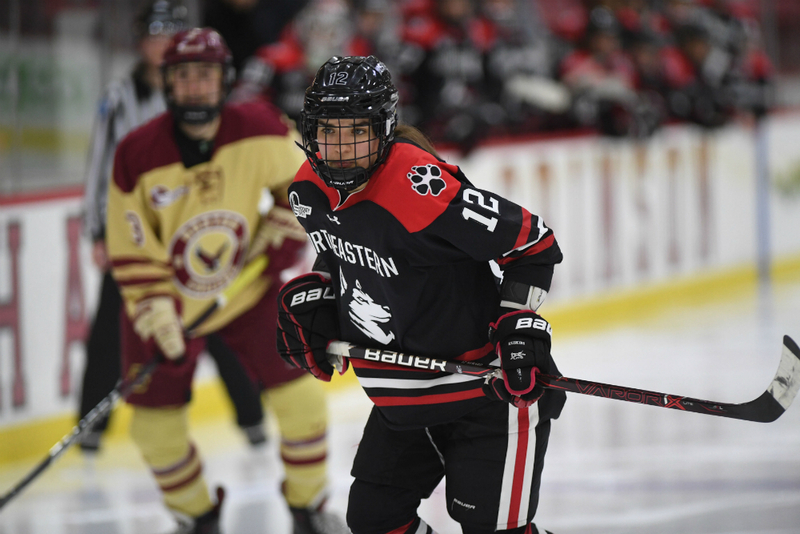 She quickly turned heads, though, once she arrived at Northeastern, and put up 12 goals, 19 assists, and 31 points while playing on the Huskies’ top line this year. She was named to Hockey East All-Rookie Team and ranked in the top 10 in freshmen scoring nationally. Flint, too, has taken note of Aurard’s passion for the game, and so has France women’s national team head coach Grégory Tarle. Aurard already has plenty of experience with the French national team. She played on the Under-18 Team at the World Championship three different times (once at the top level, twice at the Division I level). She made her first appearance at the IIHF Women’s World Championship with the senior team in 2015. She’s played in three World Championships since then, plus the Olympic qualification tournament leading up to the 2018 PyeongChang Games. France is not a traditional hockey powerhouse, but has slowly climbed up the IIHF rankings and performed better and better at the Division IA World Championship. Last year, they won the tournament and earned a promotion to the top division for 2019. This will be France’s very first time competing at the top level, where they’ll join the Czech Republic, Germany, Japan, and Sweden in Group B. Still, Tarle feels like they are ready to handle the challenge of playing at the highest level. 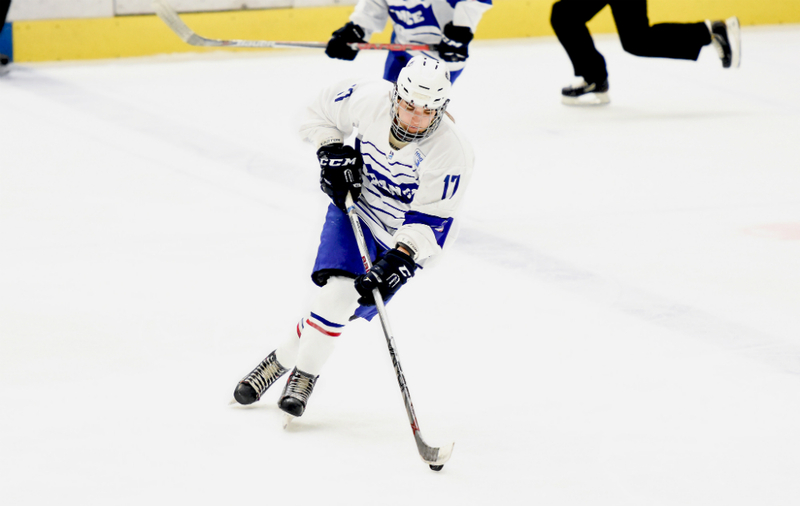 Several players have picked up valuable experience playing outside of France, including collegiate hockey in the United States and Canada, and the SDHL in Sweden. Team France also learned some valuable lessons along their journey to winning the Division IA World Championship. They missed out on qualifying for the 2018 Olympics, but picked themselves up after that to take home the World Championship title. For Aurard personally, there’s a lot she’s learned while leading the way at Northeastern this year that can help her with Team France over the next couple of weeks.